I can not always go out during my lunch pause now, because of the changing weather. So, some days I just stay in my office - especially the rainy days. What does one do then ? Reading, searching on the internet, looking for nice patterns, trying patterns in my sketch book etc. One day, I wanted to change my desktop background, because it was a bit boring. 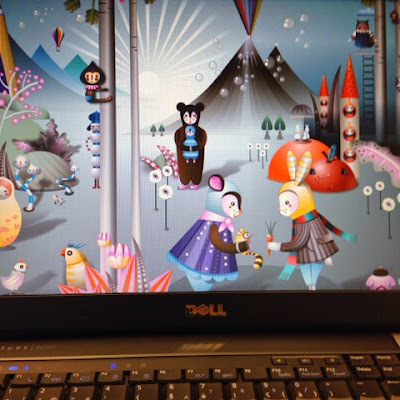 I looked at the possible backgrounds on my PC and found just a nice one that made me smile immediately. Yes, it wil be this ! I also saw a zentangle in it. I had a lot of ideas and happy thoughts looking at it. Always when I looked at it, I saw something else. Very amusing. 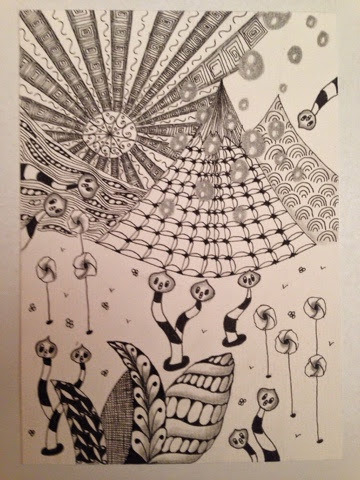 And during lunch pauze some days later, I made this Zentangle Inspired Art card. The little worms in the card reflect my happy thoughts. It hangs in my office now, to remind me on having a happy thought each day.